William Weimar, 68, a former owner of an Alaska-based company, has pleaded guilty to making $20,000 in illegal payments to cover consulting and advertising expenses incurred by a candidate running for an elected position in the Alaska state legislature, Acting Assistant Attorney General Matthew Friedrich of the Criminal Division announced today. Weimar also admitted that he manipulated and structured the illegal payments to avoid currency reporting requirements for financial institutions under federal law. Weimar pleaded guilty before Chief U.S. District Judge John W. Sedwick at the federal court in Anchorage to a two-count information charging him with conspiracy to commit honest services mail and wire fraud and structuring financial transactions. In court documents, Weimar admitted to conspiring with the candidate, the owner of a company that provided consulting and advertising services to the candidate, and others by paying the consultant approximately $20,000 in 2004 for expenses incurred by the candidate's campaign. Weimar admitted that he, the candidate, and the consultant agreed to make these payments in a manner that concealed the payments and deceived the public. Weimar admitted to making these payments to secure the candidate's election to the Alaska state legislature, to deprive the public of the honest services that the candidate would provide as a state legislator, and to gain the candidate's official support for legislation that would benefit Weimar's ongoing financial interest in a private prison project. At sentencing, Weimar faces a maximum penalty of five years in prison and a $250,000 fine. Sentencing has been set for Oct. 29, 2008. Including Weimar's plea, there have been eight criminal convictions to date arising out of the ongoing investigation into public corruption in the state of Alaska. Thomas T. Anderson, a former elected member of the Alaska House of Representatives, was convicted in July 2007 and sentenced to five years in prison for extortion, conspiracy, bribery and money laundering for soliciting and receiving money from an FBI confidential source in exchange for agreeing to perform official acts to further a business interest represented by the source. Peter Kott, a former Speaker of the Alaska House of Representatives, was convicted in September 2007 and sentenced to six years in prison for extortion, bribery and conspiracy. Victor H. Kohring, a former elected member of the Alaska House of Representatives, was convicted at trial in November 2007 for attempted extortion, bribery and conspiracy, and was sentenced to three and a half years in prison. In March 2008, James A. Clark, chief of staff to the former governor of Alaska, pleaded guilty to conspiracy to commit honest services mail and wire fraud. 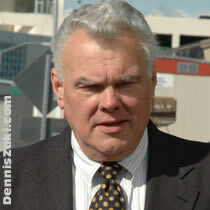 Former Anchorage lobbyist William Bobrick pleaded guilty in May 2007 to felony public corruption charges. Two executives of VECO Corporation have also pleaded guilty to felony public corruption charges. U.S. Senator Theodore F. Stevens was indicted on July 29, 2008, and trial is scheduled to begin Sept. 24, 2008. John Cowdery, a current member of the Alaska state Senate, was indicted on July 10, 2008, and is also awaiting trial. This case is being prosecuted by Trial Attorneys Nicholas A. Marsh and Edward P. Sullivan of the Public Integrity Section, headed by Chief William M. Welch II, and Assistant U.S. Attorneys Joseph W. Bottini and James A. Goeke from the District of Alaska. The ongoing investigation is being led by the FBI and the Internal Revenue Service Criminal Investigation.